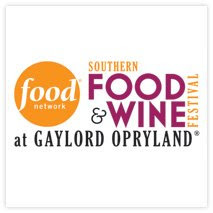 I soooo want to go to the Food Network's Food and Wine Festival in Tennessee next month. I love almost all of the food Network Stars but I'm a stan for the Neely's. If you don't know who they are, you better ask somebody! Better yet, just follow them on Twitter: @the_neelys. Oh! Oh! Oh! I would so love to see this happy, fabulous, pork loving couple in person. I love it when Gina Neely tells her husband: "You're always stealing my sugar!" whenever he comes in for a kiss. They just keep it REAL on tv.